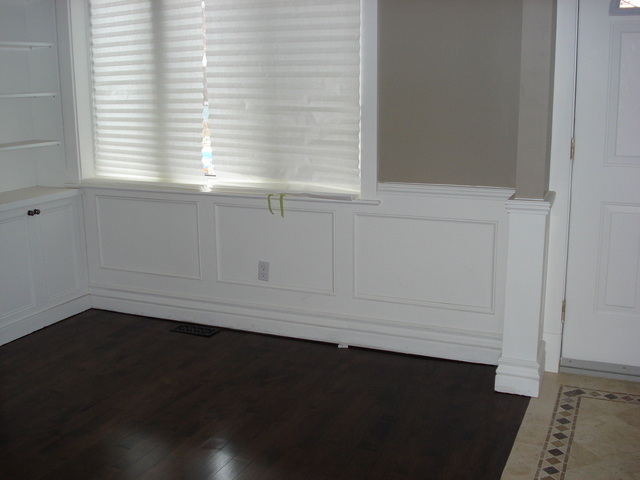 In August/September 2009, having researched carpenters on Home Stars and having seen photos of Ewen's wainscotting work, my husband and I decided, as part of a larger self-contracting renovation, to hire Ewen to do extensive wainscotting work throughout our house, and he did not disappoint. It was the added touch that gave the house the "wow" factor at a cost that was not much more than pre-fabricated panelling, which in the end would not have looked anywhere close to the "real deal" once it was done. There were a lot of contingencies to deal with in an old house and Ewen mastered them beautifully. He is a true craftsman, a gem among a sea of people who would like to call themselves tradesmen, but who truly cannot deliver the quality of work that can only come from years of training and experience. We have him returning in the new year for more work and my husband and I would never think of hiring anyone else. Natasha, Joe and the family were gems to work with. Great people, greater senses of humor, and all around first-class, salt-of-the-earth people. I can only hope that they will be requiring my services in the future. You guys rock!